Polar bears sure make playing in the snow and ice look fun. In fact, these animals have such thick coats that sometimes they get too warm. Then they dive in the icy water to cool off. Their coats are very thick, but they also have lots of body fat, which keeps them warm too. All polar bears live in the north. They live in Alaska, Canada, Russia, Norway and Greenland. They are strong hunters. Their favorite food is seal. Polar bears can smell a seal up to 20 miles away! They wait on the ice for seals to come up for air. They also eat caribou, grass, walrus, beached whales and seaweed. Polar bears sleep in caves during the winter. Mama bears have babies during their winter nap. The babies nurse and play until mama wakes up. Polar bears play and slide in the ice and snow. Polar bears are the biggest bear in the world. Males weigh almost 2,000 pounds. That’s almost as much as a small car! 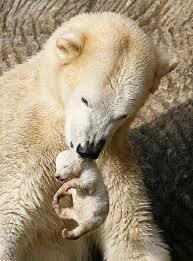 Polar bear cubs are very small. They’re about the size of a stick of butter! Polar bears have 2 to 4 inches of fat under their skin. 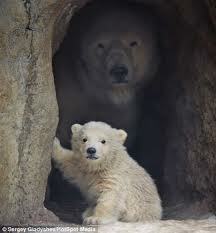 More all about polar bears, they sleep in caves during the winter. A video documentary about the lives of polar bears and how they can survive the cold. Question 1: Is a polar bears fur white? Answer 1: No, the fur is actually made of clear, hollow tubes filled with air. Question 2: Are polar bears endangered? Answer 2: Yes, as the world becomes warmer, the polar bears habitat is shrinking. Question 3: Do polar bears live in Antarctica? Answer 3: No. You might see pictures of penguins and polar bears together, but polar bears live in the Arctic (north pole), while penguins live in Antarctica (south pole). Question 4: How long do polar bears Live? Answer 4: Generally up to 18 years but on rare occasions The oldest polar bear in captivity lived up to a ripe old age of 45 years. Question 5: What is a baby polar bear called? Answer 5: Baby polar bears are called cubs. Question 6: Are polar bears fast runners? Answer 6: Oh yes and you will not outrun a polar bear, they can reach speeds of 40 km/h per hour. However they much prefer to save their energy. Running at speed is only done over short distances but a younger bear can run for 2 Kilometers. Best to give these guys plenty of space. Question 7: Where do polar bears live? Answer 7: Polar bears live in the Alaska, Russia, Canada, Greenland & Norway. Question 8: Are polar bears good swimmers? Answer 8: Did you know that the polar bear is known as Ursus Maritimus, meaning “Sea Bear”. Polar bears are exceptional swimmers. A polar bear can swim up to 10 kph and can swim for many hours nonstop and cover long distances. They can swim underwater for up one minute or a little more and have very good underwater vision. 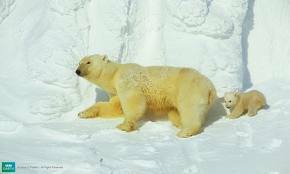 Enjoyed the Easy Science for Kids Website all about Polar Bears info? Take the FREE & fun Polar Bears quiz and download FREE Polar Bears worksheet for kids. For lengthy info click here. Declan, Tobin. " Polar Bear Fun Facts for Kids ." Easy Science for Kids, Apr 2019. Web. 23 Apr 2019. < https://easyscienceforkids.com/all-about-polar-bears/ >.